This article appeared as a column in the ‘Small Enterprise’ Entrepreneur Business Magazine in Oct 2014 issue. Marketing is all about creating great customer experiences, consistently. It has transformed itself significantly over the last few years, thanks to digital marketing. Today, marketing is not just meant for large corporate (which were the case decades ago) but for every startup, SME can boast to benefit from. A study by MIT Sloan Management Review and Capgemini Consulting on ‘Embracing Digital Technology’ finds that, according to 78% of respondents, achieving digital transformation will become critical to their organizations within the next two years. This was the study on traditional large corporations. This underlines the importance of digital technology that needs to be embraced in order to achieve success. In other words, without this you do not dream of taking your organization on a success path! Digital technology is changing the industry and competitive landscape. Though many CEOs acknowledge the importance of digital marketing, it is the question of time and consistency with which these are being managed and executed. Though digital marketing can be encapsulated into inbound and outbound marketing, the strategic pieces still can lie with the CEO themselves. Out of the many outbound marketing techniques that include display ad like Google Adwords, Webinars, Virtual conference, email marketing stands tall. Being an advocate of email marketing myself, I cannot resist saying that it is one of the most potent weapons that a company can use; more importantly even for a small enterprise, or a startup venture. According to a McKinsey report, reaching people through e-mail is 40 times more effective than Twitter and Facebook combined. Yes, it is a mind boggling 40 TIMES! These stunning numbers prove that you as an enterprise cannot afford to miss out on this great marketing tool. Why is it so powerful? Everyone (certainly most) of us checks email at least once a day, and probably the first thing in the morning. Besides, almost 3/4th of customers prefer to receive marketing messages through an email. Having now understood its importance let us see how best you can put to use this strategy. The first step is to build an email list. You can buy the list, and/or you can start collating this over a period of time. It is kind of an ‘always-on’ activity. Beware of anti-spam challenges. A tip – you can pick your connections from social media (relevant ones), other contacts, and prepare a list to start with. The next importance element is the ‘messaging’. Your message should build trust and be relevant. Customers do not want to see just ‘sales mails’. At some point in time it will be treated as spam and junked. So share information that are worthy, informative, a note as to how you can possibly solve their issues or challenges or save money, general insights, reports, etc. This will help you position as a thought leader in this space. I have recommended and helped my clients build their brand and reach through smart email marketing techniques. For one of my consulting clients, we had shared an interesting article to a senior level vendor management person with a billion dollar enterprise in the US. Reaching out this contact over email or phone, might be next to impossible as they would be flooded by sales calls/mailers every other day. But with a non-sales, informative mailer that was shared, my client received a response from this billion dollar prospect requesting them to fill up an RFP that they sent along with their mail. Bang! What a smart and powerful way this email marketing can be? And this is without any sales effort, without thousands of dollars spent in sales follow ups (and still doesn’t guarantee an RFP though). Create an interesting subject line. Most often, mails get read based on the excitement / interest that the subject line provides. There is no one standard thumb rule to say how exactly the subject line should be. Some may argue to short ones, while some for a lengthy one. But fundamentally make it look interesting, and that addresses ‘what’s in it for me’? 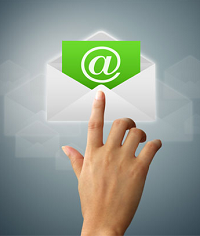 Personalize as much as possible, your email contents. Rather than just sending one mass mailer you can address the person by his/her name in the starting place; or you can even have their name addressed in the subject line itself. Human touch is essential in creating engaging content and that will be a key. Engage a good content writer and keep churning out articles of interest, blogs that can position you as a thought leader in that space. Though developing content in-house is best, I have noticed most often that in companies the priorities would be different at different times and good articles do not come through as planned. In such cases, best is to engage content writers to ensure that messaging is happening with consistency; your strategy should define the frequency of such posts, timing, etc. Include Social Media links in your posts / email. This way, it will help share these articles through popular social media sites directly. It can turn viral and your brand / offering can reach through extended connections that you would not have dreamt of. Most use mobiles to open emails, so it is imperative that your content gets displayed across all devices fine. Care should be taken so that rendering is checked across devices before your email campaign is triggered. Now, how do you send this? Though outlook? A strict no-no! Use CRM solutions and the beauty of that is ‘analytics’. You could slice and dice your data, contacts, and send targeted messages, and campaigns. Here is an important point; I am not suggesting you to drop other modes of digital marketing and advocate only email marketing. Email marketing can be used, along with other digital marketing techniques like retargeting, etc. the right combination when used can be very powerful. When your digital strategy is encompassing a few areas synchronized well, you can take your enterprise to a significantly higher level in building up your brand and business.